The Veronica's Veil Mantilla for Lent. 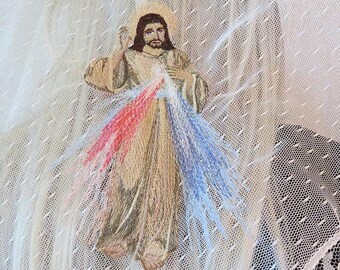 An exceptional devotional veil for Catholic Women. 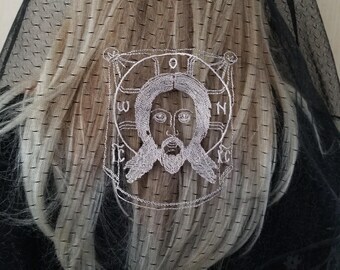 The Holy Face of Our Lord is embroidered in sepia brown thread on an ivory point d'espirit lace and paired with a gently flowing black lace trim. This veil is triangle shaped, but you may request a D shape. It is also available in other colors. The heroic acts of love that make saints don't always involve being burned at the stake or boiled alive. Sometimes a simple act of compassion can be heroic as in the case of St Veronica. That world-changing Friday it wasn't safe to be a follower of Jesus. Veronica looked on Our Lord's suffering. She could not carry His cross nor take His pain away, but she did what she could. She removed her veil and wiped His Holy Face. The Veiled Woman commemorates that act of courage with the Veronica's Veil mantilla. Available in silver on black, light brown on ivory and cream on light beige. 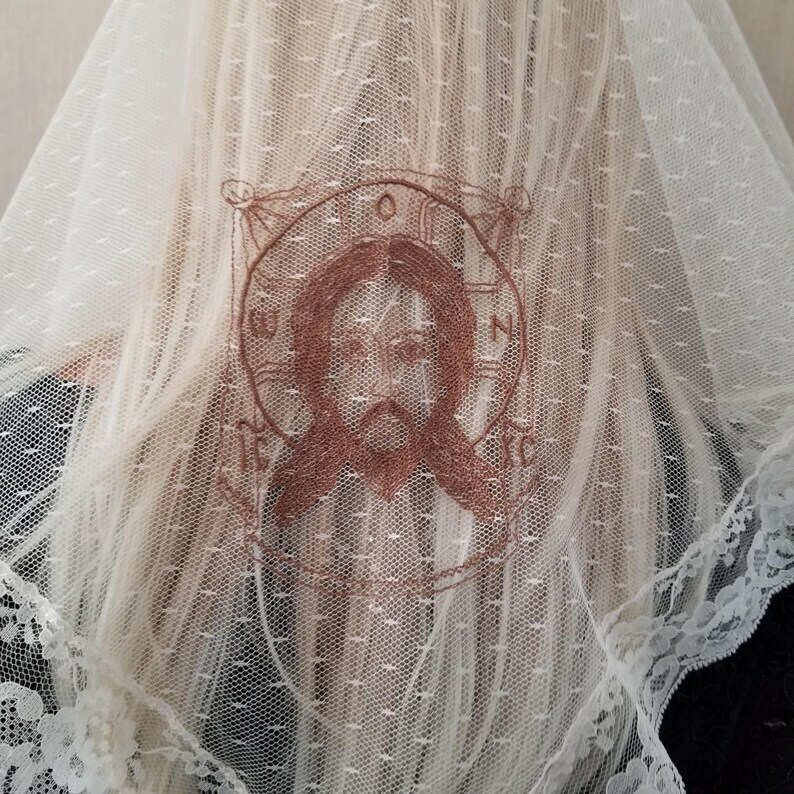 A reminder of Our Lord's love for us, this chapel veil is excellent for Traditional Catholic women to wear on any Friday of the year, during Lent, at funerals or during meditation at home. Fit with our exclusive hidden loop so you can secure the veil safely to your hair without damaging the lace. You may also select a removable comb. Your veil comes with a carry pouch with a separate pocket for your rosary, matching hair pin, prayer card, and floral sachet to keep your veil fresh. The Veiled Woman line of exquisite handmade mantillas and chapel veils is handmade one by one in the USA.